College can be a very eventful, vibrant, eye-opening experience for anyone. It can also feel like a four-year-long marathon of stress, long nights staying up studying, followed by long days in bed watching Netflix. While all of those are inevitable, I learned quickly during my first year that getting involved on campus is an absolute necessity. You may have heard a thousand times before coming to Butler, but it cannot be understated how important it is to be actively involved on campus. Otherwise, your four years will feel like a drag. Luckily, there are hundreds of opportunities to get involved in the Butler community. Some of which even help strengthen the academic and social aspect of being a college student. This year, there are more than 40 different intramural opportunities for students. Butler invites students to make teams for various sports that range from basketball to euchre. 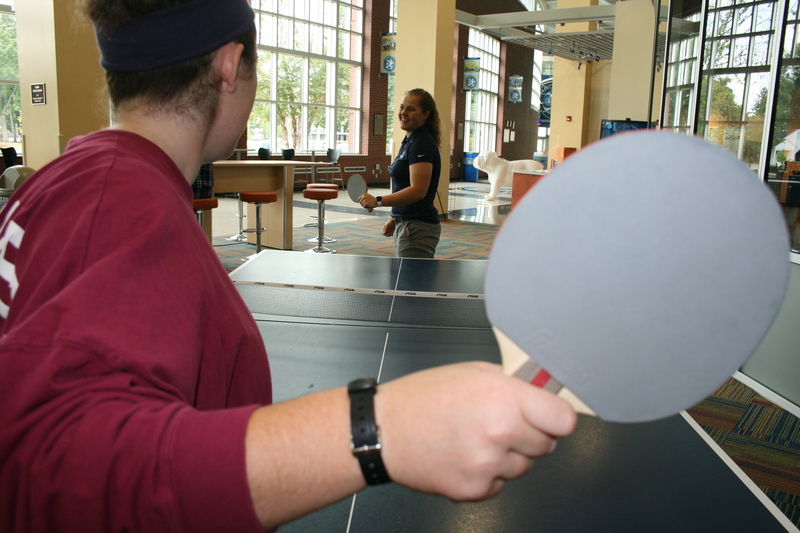 Some sports offer a co-rec league, as well as individual events like table tennis. All events can be found on the intramural sports page on Butler’s website, where the link to sign up for each event is also available. One of the many job opportunities campus has to offer is serving as the officials for those previously discussed intramural sports. This position pays and can connect students closer to others on a weekly basis via the competitions, staff training and meeting new students that are coworkers. Sophomore business major Phil Faso worked as an intramural official as a first year and enjoyed the community that came with the job. Looking back, I believe having a job during my first year of school was one of the best decisions I made. While it is nice to earn money during the year, the friends I made while working as a lifeguard always kept work from feeling like a burden on my schedule. There are jobs available beyond the HRC as well. Metro Diner and Scotty’s Dawghouse have several student employees, as well as the Butler Bookstore and Irwin Library. Butler has more than 150 clubs and organizations that, per Butler’s website, 94 percent of students get involved in while they are not in class. While it is not uncommon for a student to join a club or organization, there is a much smaller number students that have gone out and started their very own club or organization. One example of this being senior chemistry/pre-med major Avni Johnson. During the fall of her junior year, Johnson founded the South Asian Student Association. The South Asian Student Association is an organization that seeks to not only provide a home for the community of South Asians at Butler, but also advocate for broader diversity expansion on Butler’s campus. Johnson founded the South Asian Student Association because she felt there was a lack of diversity on campus. “I remember as a first year student it was quite lonely at times never having anything or anyone that understood where I came from or what my values were,” Johnson said. While serving as the president of the South Asian Student Organization, she is also the president of Butler’s the National Society of Collegiate scholars and an emerging leaders mentor. Johnson thanks Emerging Leaders for teaching her to be ambitious, which she credits for helping her decide to start the South Asian Student Association. Johnson advises first years who are not involved on campus to not shy away from new opportunities or let the time commitment make your decision for you on whether you will get involved or not. Butler has more than 20 service organizations that are centered around giving back to beyond the Butler community. One of those organizations is Best Buddies, which sophomore communication sciences and disorders major Grace Anderson joined during her first year. Anderson said she joined the organization because she knew it was an important one. She said Best Buddies has not only offered her experience in working with kids with disabilities, but also has given her a friend who she has learned new values from and with whom she has made memories. Anderson said she recommends Best Buddies because it is a rewarding experience, not just for you, but also the buddies. While the year is still young and students are still getting into the rhythm of things, it is important to remember that it is never too early, nor is it too late to get involved when you are a Butler Bulldog. Try out things you think you would like, but do not shy away from opportunities you are unsure about. There is no wrong choice when it comes to being an active Bulldog.